Amari Cooper was taken into the locker room after being on the wrong end of a helmet-to-helmet hit from Seahawks safety Bradley McDougald. On 2nd-and-20, Derek Carr sent an errant throw down towards Cooper’s shins, leaving him in an exposed position to get blown up the way that he did. No penalties were called on this play. Cooper, whose name popped up in trade rumors this morning, was able to leave the field under his own power, but not before appearing to go limp then staying down on the field for a bit. Last week, the Seahawks were involved in another big hit controversy when Tedric Thompson lit up Brandin Cooks. Here, McDougald doesn’t just make helmet-to-helmet contact with Cooper on the hit, he hits him while he’s hung out to dry as a defenseless receiver—one of the more frequently called unnecessary roughness penalties in recent seasons. 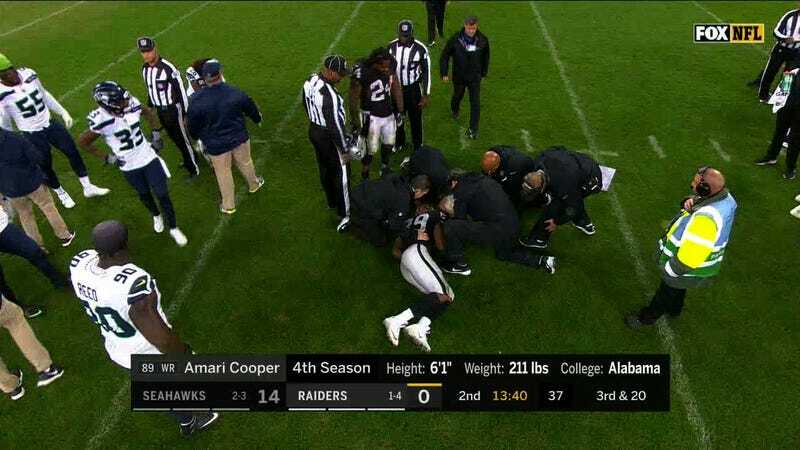 Even with those two factors in play, officials didn’t do anything but allow medical staff to help Cooper off the field. While gross, it’d be on-brand for a league that has proven to be wildly inconsistent about the safety of its players—allowing a small, elite, and mostly white group of players maximum protection, and another the Ivan Drago “If he dies, he dies” treatment.